In the first few weeks of 2012, we have certainly seen some strange occurrences throughout the U.S.: Snowmageddon and drenching rains for the Pacific Northwest, wildfires in Nevada and Texas, high temperatures across the central and Southern U.S. ranging between 15˚and 20˚F or more above normal, and snow amounts in Alaska as much as 160 inches above normal for this season. All this makes me think Mother Nature is trying to take the "Extreme Weather of 2011" and rebrand it as the "Extreme Weather of 2012." Chicago saw one of the slowest starts to its snow season in the past 30 years, and the Northeast hasn’t really seen much snow at all, or even winter weather for that matter. What in the world could be contributing to this unusually mild winter? There may be a few factors we have to consider: La Nina and the Arctic Oscillation. 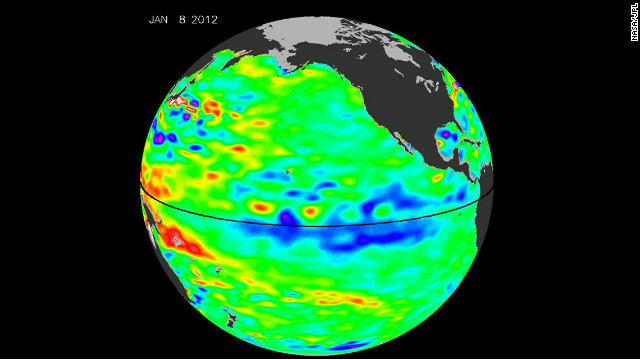 First, let’s talk about the effects of La Nina, which NASA so affectionately referred to as “the diva of drought.” On January 18, NASA and the Jet Propulsion Laboratory released sea surface height and temperature data collected from their Jason-1 and -2 satellites. These are altimetric satellites, meaning they can detect sea-level heights and thus determine the temperatures of the water. How can sea surface heights tell us what the water temperatures are? Think about how air expands when it heats up. Water does the same thing, so when these satellites see higher sea levels, it means those waters are warmer. Take a look at the satellite image above. As a word of caution, as cool as these images may appear, what they tell us may not be as exciting. The reds and yellows indicate warmer waters, and the blues and purples indicate cooler waters. Notice the blob of blues in the eastern Pacific? Those are the cooler waters that contribute to La Nina, and they’ve gotten slightly cooler, meaning La Nina has strengthened. This La Nina was a more moderate event, but now that it has strengthened, that could mean continued stormy conditions across the Northwest this winter and spring. This could also lead to worsening wildfire conditions over the Southwest and Southern Plains, and scientists are now expressing concerns about conditions across Southern California and parts of the Southwest. The Colorado River basin has seen more dry years than wet years over the past decade, and Southern California has seen only two normal years of rainfall in the past six years. Experts fear that these conditions could lead to low water supplies if they do not see some improvements soon. Although we know what La Nina can do to our weather patterns, there are other factors we have to consider. One particular climatological index that is affecting our weather is called the Arctic Oscillation. This is an index based on the differences in sea level pressure and the relative intensity of a semipermanent low-pressure area that is centered over the North Pole. When this index is in a positive phase, that means the vortex is very strong and the upper-level winds restrict the arctic air to the North Pole, keeping it far away from North America, Europe and Asia. When the oscillation is in a negative phase, the circulation of this polar vortex is much weaker and allows the arctic air to spill into those same regions. It has been noted that this oscillation has been positive for the most part since the 1980s, but it has become slightly more positive over recent decades, to which scientists contribute the warmer conditions across much of the Northern Hemisphere. In addition to this Arctic Oscillation, there is another climatological index called the North Atlantic Oscillation, which was actually responsible for the brutal winter of 2011 for the Eastern and Southeastern U.S. The North Atlantic Oscillation is an index representing differences in pressure across Iceland and the Azores. When this index is in a positive phase, it forces the colder arctic air to stay far to the north in Canada, but when it is negative, as it was through winter 2010-11, it allows that arctic air to dive into the Southeastern US. This index is known to override the effects of La Nina, and unlike El Nino and La Nina, which change on the scale of months, the North Atlantic Oscillation can change phases within a matter of one or two weeks. Compare this with the current atmospheric conditions and how warm it has been throughout the eastern U.S. The oscillations have been in a positive phase, keeping the arctic air farther north, but one quick shift of the North Atlantic Oscillation, and we may not be so excited about the snow and bitter cold it could bring! It is the best time to make a few plans for the longer term and it is time to be happy. I have learn this publish and if I could I want to recommend you some attention-grabbing things or suggestions. Maybe you can write subsequent articles referring to this article. I wish to read more issues about it! This is some excellent information, that you have provided within the article. But how can someone apply it assuming they lack much money? WELL WITH THE END OF THE13th BAKTUN FAST APPROACHING DO U REALLY EXPECT THIS 2 GET BETTER THIS IS JUST THE BEGINNING! What kind of answer is that.? How about eilnaxping things a little bit, to us simpletons? Why not mention La Nina and its effect on the jet stream that usually swings down and brings arctic air masses and weather with it? How about reminding us that this is normal and happens periodically, but this year the jet stream is more or less circling the arctic circle? Weather is never simple, but it is not a complete mystery that can't be simplified to some degree. I think the article was fairly interesting, but I had trouble following the remainder of your reasoning after the statements about sea surface heights. Water does NOT expand when heated, at least until it becomes steam (a gas) which of course does expand....and if all of the ocean waters are steaming, winter weather patterns will be the least of our worries. The sea surface levels would be higher because of reduced moisture in solid form (melting polar ice being the main culprit there), not because the water is warmer and has expanded. Please note that melted ice does not necessarily mean that the waters are warmer, either. Actually water in its liquid form does expand and contract depending on temperature, like any fluid. It is just such a small difference. Liquid water is at its highest density a +4 degress Celcius (approx 39 degrees Fahrenheit). It's been in the 50's in NYC lately in February so its certainly bizarre weather. However, last year was absolutely freezing as usual so I'm not sure one season should be considered a trend. global warming is real!?!? whaaaa? who knew. We will always see humans criticizing the weather...just as above stan's ...its just nature..
3 comments? 3?! When an imbalance in national politics occurs everybody runs around like blind men till they smack into the wall. But something more serious like an imbalance in climate condition and theres hardly a peep! Ya wait till summer hits us, and the heat waves start killing people all over, or forest fires destroy whole neighborhoods. Oh ya im sure ppl will be asking why then. The amount of snowpack is critical to stabilizing global temps. If you cant reduce the average temperature over the winter then the average temperature over the summer will reflect change accordingly. Or if say your average winter temps are 30 degrees above normal what is to say the summer months wont be the same? This will in turn increase warm water exposed to polar ice and you get to watch it shrink even more! I often refer to that ice as the worlds air conditioning. When it breaks down your cold fronts coming south dont condense the water in the air to produce rain creating drought conditions and oh ya crops fail, spiking food prices ect. Ect. Then we get massive hurricanes fueled by all the heat needing to be thrust into the upper atmoshere because its got nowhere else to go. Seriously ppl, wise up! Ever hear of the game "dominoes"? I have a very small carbon footprint, so there is little I can do to change this. However, those who are in a position to make a difference (like the president, for one) no longer even mention climate change. It is frightening to think that our president, who was elected by those concerned for the environment, has allowed these conditions to worsen. I only hope the next president will rise to the challenge. A bit of an alarmist huh? It's called weather and it changes every day. A few years warm a few years cold, that's why we take averages. Weather describes the conditions in a particular, limited geographical area over a short time span, from hours to days. Climate describes regional or global conditions over a longer time span, from weeks to millenia and is concerned with the systems and factors that create these conditions. The term "Mother Nature" should be banned from the English language!